The NEXUS series of sticks is the family in the Bauer stick line-up with a Tru-mid flex profile. If you are a player that is looking for a well-balanced stick with a quick, effortless release with natural power, you should give these a serious look. 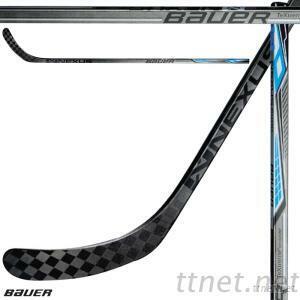 The Nexus 8000 is a true one-piece stick which means that through the single molding process, which Bauer refers to as their Monocomp Technology, they can remove excess material all while improving balance and ensuring performance consistency. This is the main reason why this stick is as light as it is. Bauer also uses its exclusive TeXtreme® technology, which is a strong carbon fiber that is 20% lighter than conventional carbon. The eLASTech resin system (reinforcements in the resin that help reduce the spread of micro-fractures) can be found in the senior and intermediate models and helps extend the life of the sticks "pop" while enhancing the overall durability of the stick. The square shaft shape with double-concave walls is preferred among pros, and provides a nice secure grip no matter what shot you are taking. The Nexus 8000 is available in a nice matte finish or with the Griptac finish.